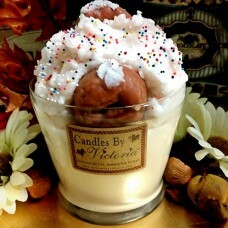 Truly one of my favorite candles, our Donut Shop candle smells amazing and looks to darn cute! We begin with a layer of Cinnamon Donuts, we then add another layer of hand whipped wax in the same scent, we circle the whole thing with wax donut embeds, pop another one on top, sprinkle with colored candies and serve it up to you piping hot. A delectable treat, but please don't eat! We have been busy creating a new line of candles for you to enjoy. Poured up in our favorite Love, Victoria jar or new Love, Victoria Bake Shoppe line is just to cute!! With over 18 oz. of scrumptious wax these candles will give you hours and hours of enjoyment!